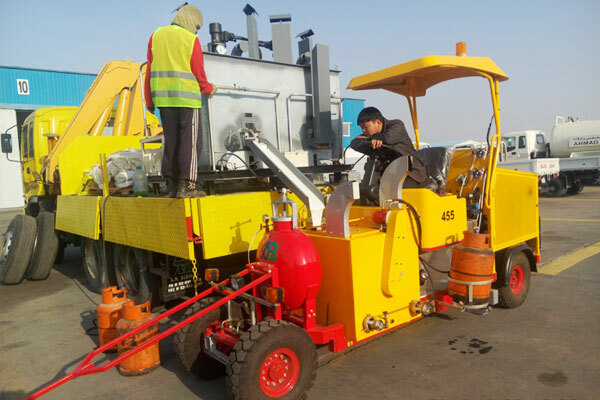 The DY-STM-I/II is a general driving type thermoplastic screeding road marking machine, small and compact, easy operation. 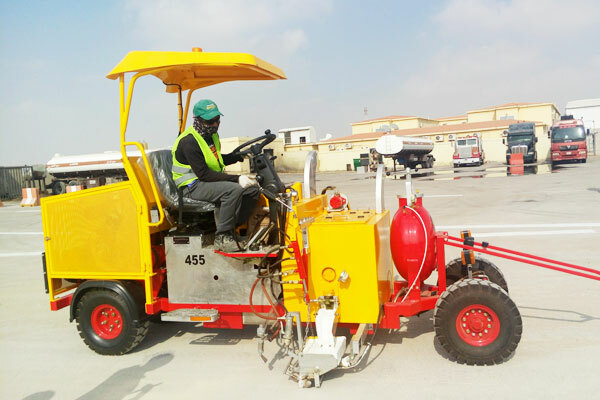 It is the optimal equipment for road line marking in medium or large urban road. Type I: pneumatic screeding flat line marking shoe. Type II: pneumatic screeding flat or convex line marking shoe. 1. Engine: Japanese Honda 20HP or American Kohler 18 HP or air-cooled electrical starting single-cylinder gasoline engine. The fuel tank's capacity is 40L. 2. 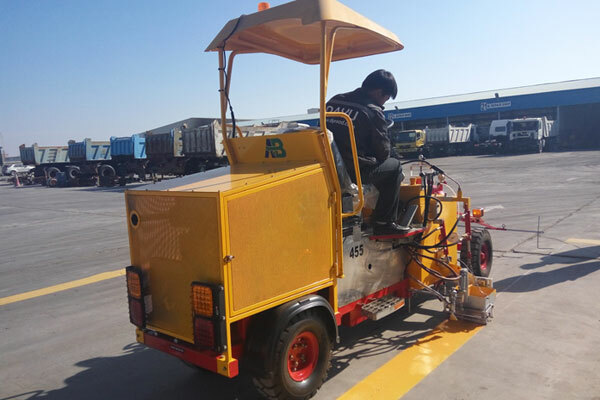 Driving system: imported oil pressurized continuously variable speed transmission system (HTS) with automatic brake device that can freely go ahead, back off and stop. The left and right back wheels are equipped with differential speed gearing to ensure it to drive freely around the curve and change directions timely. Driving speed: 0-22 km/h, maximum climbing capacity: 15°. 3. Heating mode: Propane infrared heating source, saving more than 30% gas compared with the traditional heating way. The heating is more even, more convenient, safer and more environment-friendly. 4. Marking mode: Equipped with hydraulic screeding marking shoe; structure board is made of imported special steel sheet with high-temperature resistance (2000℃) , oxidation resistance and deformation resistance. It has much better stability after stamping. The plinth is the pneumatic screeding structure that is made of special alloy steel. Floor knife that contacts with the ground directly adopts imported hard tungsten steel knife-head. The precision technique ensures its better sensibility, abrasion proof and firmness. The marking has more regular raised shape, evener and straight bottom line edge, and perfect head. The standard configuration of the marking shoe is 150 mm. (Option for other sizes according to the needs of customers). 5. Glass beads spraying system: 55L single pressure type glass beads tanks with visible window. Equipped with single glass beads spraying gun on the left or right, whose pressure , flow rate and spray width can be adjusted to ensure spraying glass beads much firmer, evener and more economical. 6. 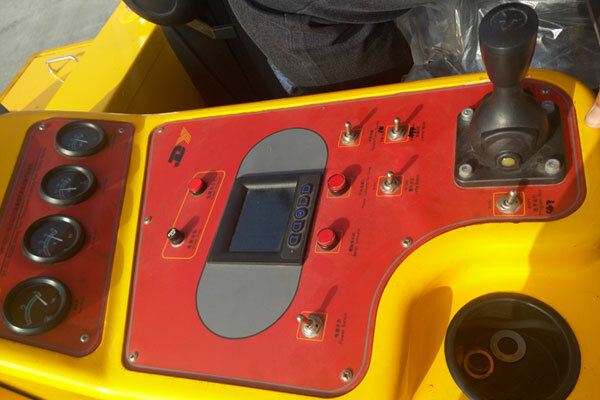 Electronic control: Set up various standard line type control mode to realize micro-electronic intelligent control; it can be freely adjusted according to the customer's personalized needs. 7. Paint tank: Cool-rolled oxidation-resistant steel paint tank, in whose interlayer the high-tech thermal insulation material is filled. Inside the tank is equipped with the hydraulic chain-driven horizontal vane blender. Paint capacity: 160L. 8. Air compressor: 0.6m3/min piston type air compressor. Air storage tank with adjustable pressure is equipped with automatic safety exhaust device. 9. Warning function: Single warning lamp whose flicker frequency (or burst flash) can be adjusted freely, it improves the safety of marking operation. 10. Guide rod: The extractable hydraulic guide rod can change directions freely to up, down, left or right. 11. Pre-mark system: It can be fitted with pre-marking system. When you marking the one line you can pre-mark another line, this greatly improves the working efficiency.